The International Weightlifting Federation (IWF) launched its Development Programme in 2009 with the aim of giving support to its national, continental and regional federations. The main objectives of the programme are to organise, control and develop the sport on an international scale and to assist all federations in their activities. Federations have the possibility to develop their organisational, coaching, training, educational and anti-doping activities or improve in any other areas they might feel need for, with the assistance of the IWF. After the project, a duly documented summary report has to be presented, including invoices, receipts etc. Federations that can make applications are those which have no outstanding debts with the IWF, have no valid sanction(s) in force and are compliant with the IWF Constitution, Technical and Competition Rules and IWF Anti-Doping Policy. A technical administration and management course was organised by the Uganda Weightlifting Federation (UWF), under the auspices of the IWF Development Programme, in Kampala in September 2018. The event attracted 16 participants, including coaches, referees, technical officials, administrators and managers, from all across the country. Professor Milan Mihajlovic, President of the Serbian Weightlifting Federation and an IWF Technical Committee member, was among those present. He worked alongside UWF President Salim Musoke Ssenkungu, an international technical official and chairman of the Weightlifting Federation of Africa Coaching and Research Committee. 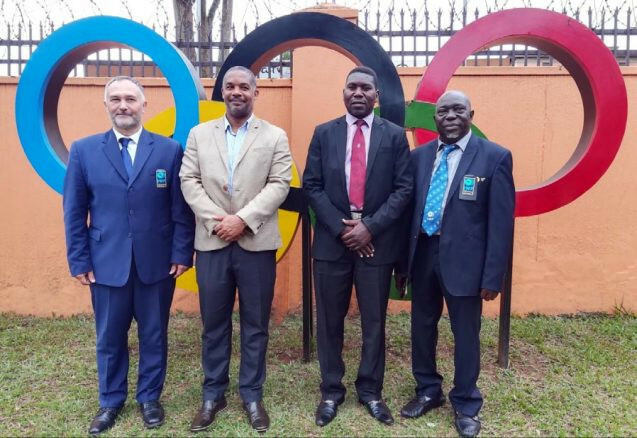 The opening ceremony took place on September 11 at the Uganda Olympic Committee (UOC) headquarters, under the guidance of Ssenkungu and facilitator Mihajlovic. UOC President William Blick was also in attendance along with David Ssemakula Katende, assistant secretary general of the National Council of Sports. The topics of discussion included preparation of an international event, the presentation of new IWF technical rules, the introduction of the new bodyweight categories that came into effect on November 1, 2018, management skills and best practices. The officials also visited a weightlifting club and witnessed how the athletes were training. The course ended with a competition, where all the skills obtained by all participants were put into practice. The closing ceremony included the awarding gala of the competition, while Ssenkungu expressed his thanks to IWF President Tamás Aján for supporting and funding the event geared towards the development and prosperity of weightlifting. 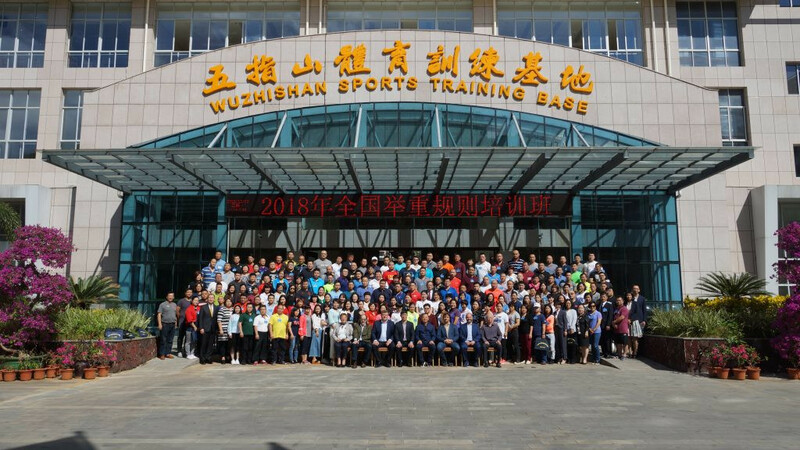 In December 2018, the Chinese Weightlifting Association (CWA) held a five-day seminar for technical officials and coaches in Wuzhishan City. The organisers, working under the leadership of CWA President Zhou Jinqiang, made use of the Wuzhishan Sports Training Base - a modern, well-equipped training hall for Chinese athletes, with 50 platforms - as the venue for the event. The 200 participants, who travelled to the island of Hainan from all provinces of China for the seminar, welcomed the professional environment and valuable lessons taken from the lecturers. Several well-recognised international professionals made presentations, including IWF Anti-Doping Commission chairman Patrick Schamasch, who brought attention to the challenges being faced in that field. Reiko Chinen, an IWF Technical Committee member, explained the latest technical rule changes to the audience. IWF director general Attila Adamfi spoke about the Olympic Movement and weightlifting’s challenges, including the Tokyo 2020 Olympic Games qualification system. The IWF was also represented by vice-president Nicu Vlad and Executive Board member Maxim Agapitov at the opening ceremony. This was on the invitation of the CWA. 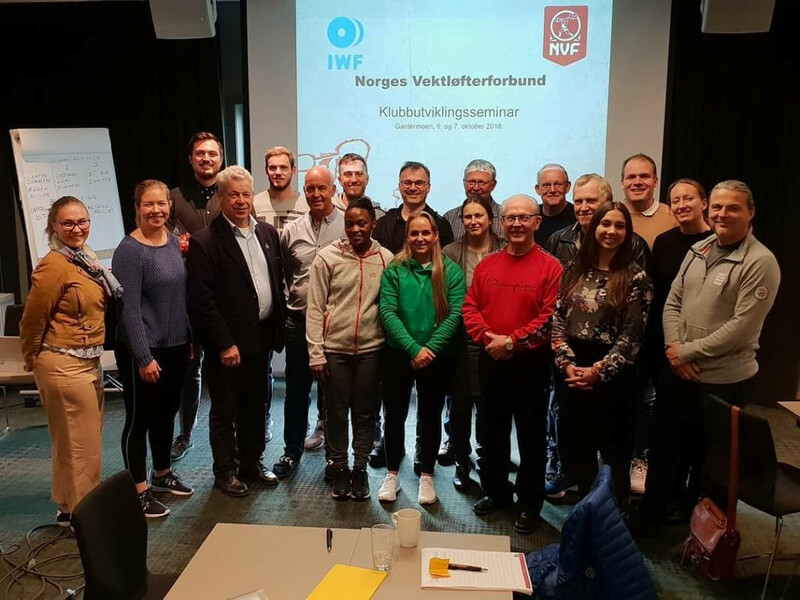 In November 2018, the Norwegian Weightlifting Federation (NWF) organised a seminar within the framework of the IWF Development Programme. The seminar was spread across a weekend with both internal and external speakers. A total of 18 participants spent the two days working towards the goal of improving the framework and development of weightlifting clubs in Norway. The first day started with an introduction from educational consultant Tiril Tøien and NWF President Hilde Næss. The political framework was presented by Næss and there were informal discussions around club development. Furthermore, Tøien presented the organisational work that lies behind club development and demonstrated the electronic registration system used in Norwegian sport. Day one came to an end with a workshop, to which participants contributed. The Educational Committee was represented by Lars Espedal and Eirik Mølmshaug, who introduced a new model for club development. The seminar continued the following day with a speaker from the Norwegian Olympic and Paralympic Committee and Confederation of Sports (NIF). Åsmund Sæbøe gave an insight into the NIF’s activities related to club development. He created several workshops where representatives from regions and clubs could work in groups to discuss strategies for club development and the practical implications of those strategies. The seminar ended after a workshop called "Sports for All". Solomon Islands’ Jenly Wini, who at Gold Coast 2018 became the first athlete from her country to win a Commonwealth Games medal by finishing third in the women’s 58 kilograms category, conducted an Oceania Talent Identification Programme (OTIP) in August 2018 to help inspire young students to pursue weightlifting in the future. The OTIP, organised by Oceania Weightlifting Federation through funding from the IWF, took place at Koloale Community High School, Hips School and Mbokonavera Community High School. Following the three-day event, Wini selected one student to attend a training camp and watch elite weightlifting events the following month. "I was impressed to see there were a lot of students that attended the programme at Koloale Community High School," the Gold Coast 2018 bronze medallist was reported as saying by Solomon Star News. "The school hall was fully packed with students who were keen to learn about weightlifting sport." Students at Mbokonavera Community High School were given the opportunity to lift weights of 2.5kg and 5kg. 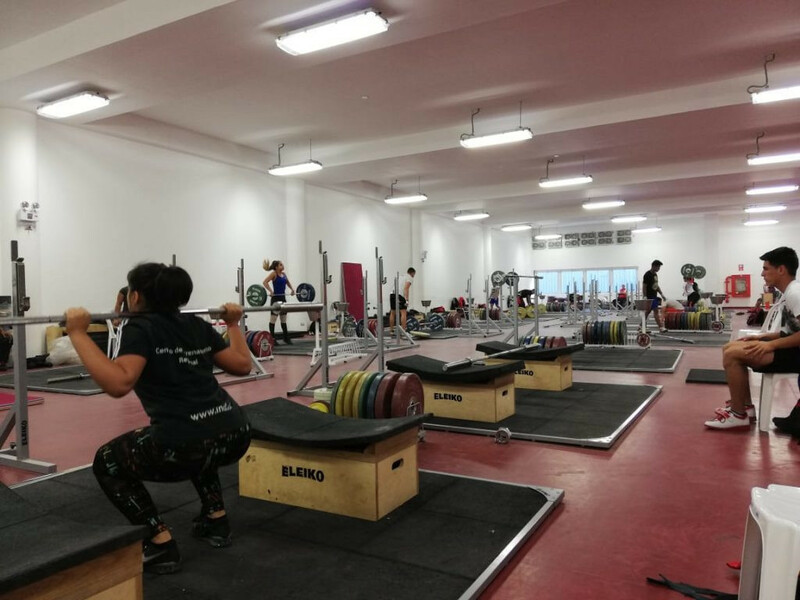 In October 2018, the Peruvian Weightlifting Federation (PWF) organised a training camp in Lima for athletes aged 17 and below, under the auspices of the South American Weightlifting Confederation (SAWC), the IWF and the International Olympic Committee (IOC). Athletes from 10 countries in Pan America were able to train with their coaches for 15 days in the sports complex of Peru’s National Sports Village. All the costs were paid through resources granted by the SAWC, IWF and IOC. Thirty athletes and their coaches had the opportunity to train four hours a day while housed in double rooms. Seminars were also conducted for them on anti-doping, the Olympic Movement and the Summer Youth Olympic Games (YOG). Among the athletes that participated in the training camp were Mexico’s Yesica Yadira Hernández Vieyra and Mauricio Cristofer Canul Facundo, the Buenos Aires 2018 Summer YOG girls’ 48kg gold medallist and boys’ 69kg bronze medallist respectively. They were joined by the likes of Colombia’s Yineth Milena Santoya Ortiz and Kely Valentina Junkar Acero, the Buenos Aires 2018 girls’ 48kg and 53kg silver medallists respectively. William Peña, President of the Colombian Weightlifting Federation, expressed his gratitude to the IWF, PWF and SAWC for the training camp in helping athletes improve their performance. Rosalio Alvarado, President of the Mexican Weightlifting Federation, added that these type of activities not only enhance techniques, but also strengthen the Olympic spirit of young athletes.